There is no way on this earth that I could follow a carb-free diet. I probably should, but quite frankly, I'd rather gnaw my right arm off provided it was sandwiched between two slices of lightly toasted ciabatta with a little aioli. So 'Bread of the Week' will become a regular feature of this challenge as I work my way through my 'Breads of the World' recipe book. Any excuse. Today took me on a slightly unanticipated to glorious Tetbury, home of the future King and his Duchy Originals brand. We went on the pretext of looking for props for our Vintage Pinups by LCC Photography venture, but there was an unspoken pact that we were really going for lunch at Blue Zucchini to sit and people-watch in the sun. Having just Googled it, I note that Trip Advisor only gives it 2.5/5 but I must say in Blue Zucchini's defence that every time we've been there, both the food and the service has been great. Okay it's a little on the pricey side - but that's what you get for dining in Charles and Camilla's back garden. 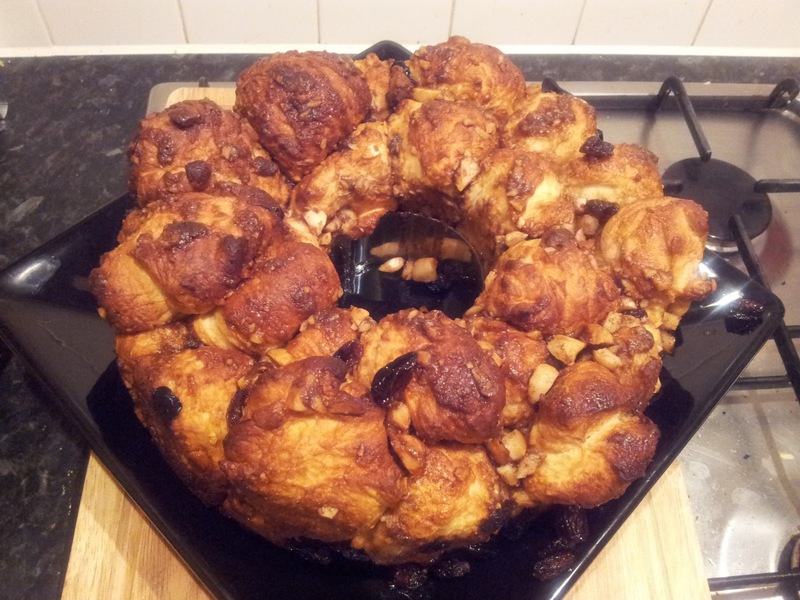 On the down side, the huge-mongous chicken club with fries that I consumed meant that my plans to do something from the lovely Thomasina Miers' Mexican Cooking Made Easy were scuppered so I decided to have a go at making Monkey Bread. I first came across this in one of the Alex Cross series of novels by James Patterson. The characters make a big deal out of cooking it for a special ocassion - usually shortly before some gruesome homicide occurs or someone tries to kidnap one of the Cross family. Actually, if I'd thought of that when I was making it, I'd've probably done something else instead to ward off any impending bad luck. Oh well, too late now. Thinking it was something mythical, soft and gooey - an assumption backed up by the copious amounts of butter and sugar that were included I was a little disappointed with the end result. According to Wikipedia, Monkey Bread is hardly known outside of the United States (unless you own a copy of Breads of the World) but I have a feeling that's because it's just a giant Chelsea Bun in disguise. Rather than unpeeling layers of bread covered with fruit, cinnamon and sugar, this is a super-size tear and share version that according to the book serves 4. It's American. Not the best ever bread recipe I've tried but the bread inside was beautifully soft - probably because the protective layer of butter and sugar stopped it drying out. Definitely one to make rarely, eat whilst still warm (is there any other way to eat home-made bread) and one that needs to be shared. Put the flour, yeast, salt and caster sugar into a large bowl and mix. Make a well in the centre and pour in the milk, water and egg. Mix to combine then knead on a floured bread board for 10 minutes. Alternatively, cheat like I did and use a mixer with a dough hook and knead on high for 5 minutes. Leave to rise in a warm place in a lightly oiled bowl, covered with lightly oiled cling film for about an hour - or until doubled in size. Combine the sugar, nuts and cinnamon in a bowl. Warm the brandy and sultanas in a saucepan until the liquid has been absorbed. Leave to cool. When the dough has risen divide into 32 pieces and roll into balls. Dip the first sixteen balls into the melted butter and then roll in the sugar mixture. Place in the pan, with space between - the gaps will fill on the second rise. Scatter the fruit over the top and then repeat the dipping process for the second sixteen balls. Leave to rise for 45 minutes or until it reaches the top of the tin. In the meantime, preheat the oven to 190C (170C - fan) or 350F. Bake for 30-45 minutes until golden.